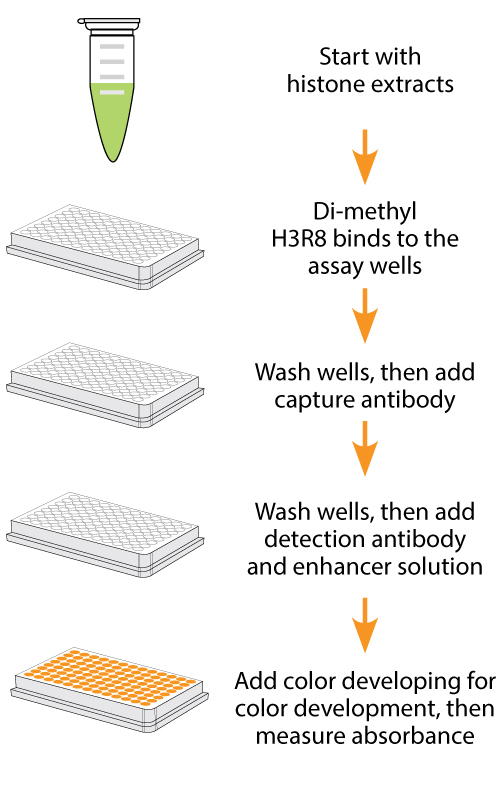 Schematic procedure of the EpiQuik™ Global Di-Methyl Histone H3R8 Quantification Kit (Colorimetric). 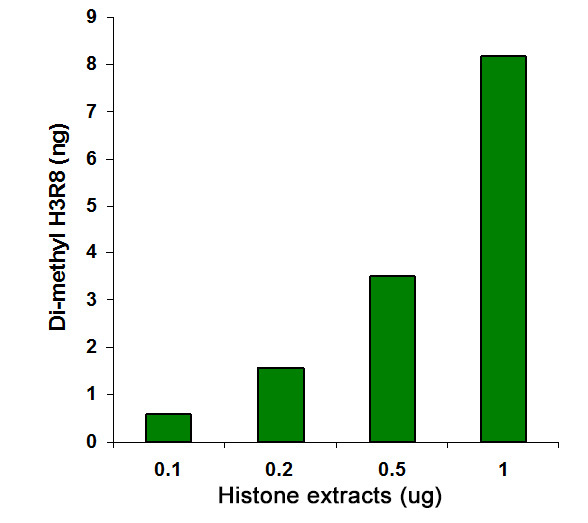 Histone extracts were prepared from MDA-231 cells using the EpiQuik™ Total Histone Extraction Kit and the amount of dimethyl-H3R8 was measured using the EpiQuik™ Global Dimethyl Histone H3R8 Quantification Kit (Colorimetric). Illustrated standard curve generated with di-methyl H3R8 control. Quick and efficient procedure, which can be finished within 3.5 hours. Specifically captures symmetric di-methylated H3R8 with the detection limit as low as 0.5 ng/well and detection range from 100 ng to 2 µg/well of histone extracts. 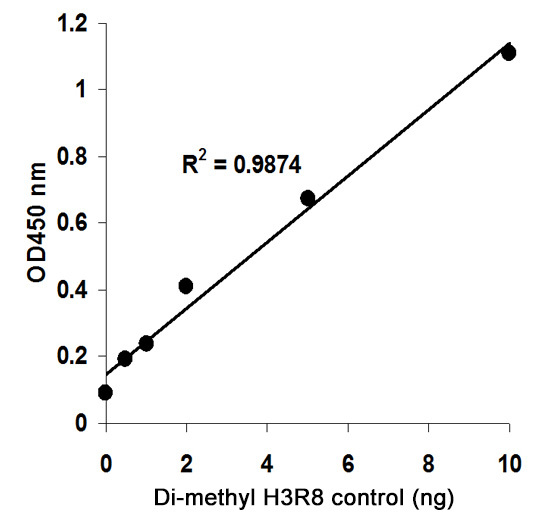 The control is conveniently included for the quantification of di-methylated H3R8. Arginine histone methylation is one of the many important epigenetic marks, and is essential for the regulation of multiple cellular processes. Arginine methylation of histones H3 (Arg2, 8, 17, 26) and H4 (Arg3) promotes transcriptional activation and is mediated by a family of protein arginine methyltransferases (PRMTs). There are 9 types of PRMTs found in humans but only 7 members are reported to methylate histones. They can mediate mono or dimethylation of arginine residues. These enzymes use S-adenosyl-methionine (SAM) as a methyl donor and transfer it to the guanidinium side chain of arginine. Based on the position of methyl group addition, the PRMTs can be classified into type I (PRMT1, PRMT2, PRMT3, PRMT4/CARM1, PRMT6, and PRMT8) and type II (PRMT5 and PRMT7). Symmetric di-methylation of histone H3 arg8 (H3R8) is catalyzed by type II PRMTs, which are found to be strongly implicated in diseases like cancer. For example, PRMT5 plays a role in the repression of certain tumor suppressor genes such as RB tumor suppressors while PRMT7 overexpression is observed in breast cancer. The global H3R8 di-methylation can be changed by inhibition or activation of type II PRMTs. Therefore, quantitative detection of global symmetric di-methyl histone H3R8 would provide useful information for better understanding epigenetic regulation of gene activation and silencing, as well as for developing PRMT-targeted drugs. This kit is designed for measuring global histone H3R8 di-methylation. In an assay with this kit, the histone proteins are stably spotted on the strip wells. The di-methyl histone H3R8 can be recognized with a high-affinity antibody and detected with a detection antibody, followed by a color development reagent. The ratio of di-methylated H3R8 is proportional to the intensity of absorbance. The absolute amount of di-methylated H3R8 can be quantitated by comparing to the standard control. Input materials can be histone extracts. The amount of histone extracts for each assay can be between 0.1 µg and 2 µg with an optimal range of 0.2 to 0.5 µg.